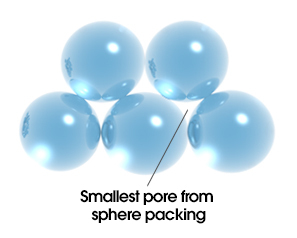 Dense packing can reduce bone in-growth due to small pore sizes and blocked off porosity. This can limit bone growth to the periphery of the implant area. 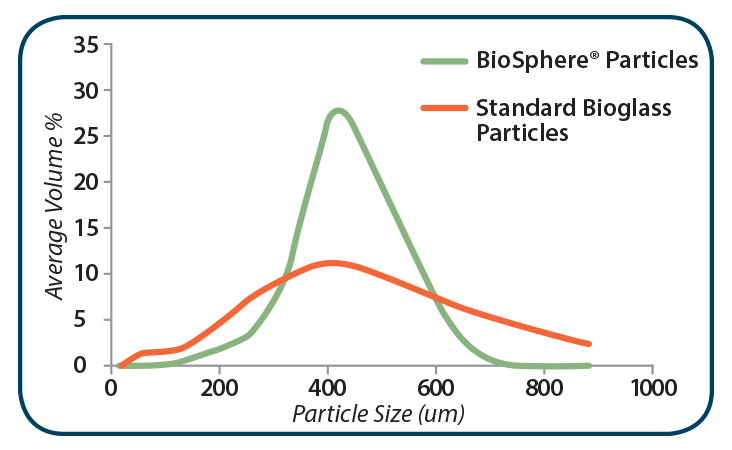 Due to the spherical shape, BioSphere particles can be precisely separated into narrow size ranges. A bimodal particle distribution can be created by combining specific size ranges. The use of specific size ranges allows for control over the dissolution and ion release profile of bioactive glass. Small particles resorb faster and generate ions more quickly than larger particles. Larger particles resorb slower and function as a longer-term scaffold for bone formation. 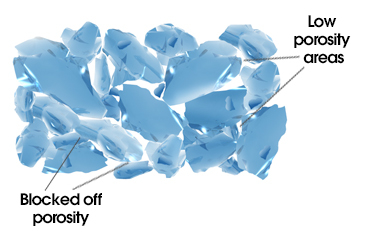 The spherical particles in BioSphere Putty take up nearly the entire volume of the Putty while still maintaining an optimal porosity for bone in-growth. This enables the bioactive glass particles to remain in contact with the edges of a bone defect after the carrier has been resorbed. Other putties with lower particle content and irregular particles can settle following carrier resorption resulting in gaps between the implant material and the surrounding bone.